A witch’s broom lurks in a scrub pine along Estes Drive Extension. Photo by Ken Moore. Over the years, I’ve enjoyed collecting witch’s brooms. Well, now, I haven’t actually collected them; I’ve merely spotted them, and revisit them often, quite often, since most obvious ones are along roadsides. They are like old friends, and I smile inside every time I pass one. My favorite witch’s broom is a fine specimen perched midway up a scrub pine, Pinus virginiana, along Estes Drive Extension between Chapel Hill and Carrboro. Just before the holidays, I spotted one midway up a loblolly pine, Pinus taeda, along the ramp from Smith Level Road onto the U.S. 15-501 bypass. Can’t believe I had never noticed it; guess I’ve been paying more attention to vehicles on the road – not a bad thing. “Witch’s broom spotting” should not become a cell phone-like distraction while driving. Last week, I spotted another one in a loblolly pine while walking through the pine forest of Carrboro’s Adams Tract. 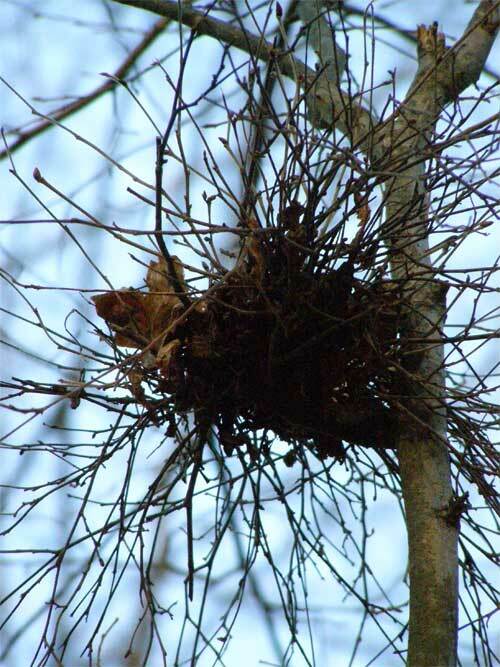 A witch’s broom is an abnormal growth in a tree, usually caused by a virus or fungus. The growth is a dense mass of shoots growing from a single point, resembling an old-timey broom or strange-looking bird’s nest. There is not a lot of information on what is really going on with this plant-growth curiosity. I suspect there is simply not enough interest or concern for any young botanist to pursue a doctoral study. I share my witch’s broom sightings with botanical garden nursery manager Matt Gocke, who is hoping to propagate some interesting-looking trees from some of the brooms. One way of producing plants with the compact, dwarf characteristics of witch’s brooms is to make grafts of the broom branches, or “scions,” onto the stems, or “stocks,” of normal-growing plants of the same species. If the witch’s broom produces cones, then another possibility is to grow a dwarf tree from a seed collected from that abnormal growth. 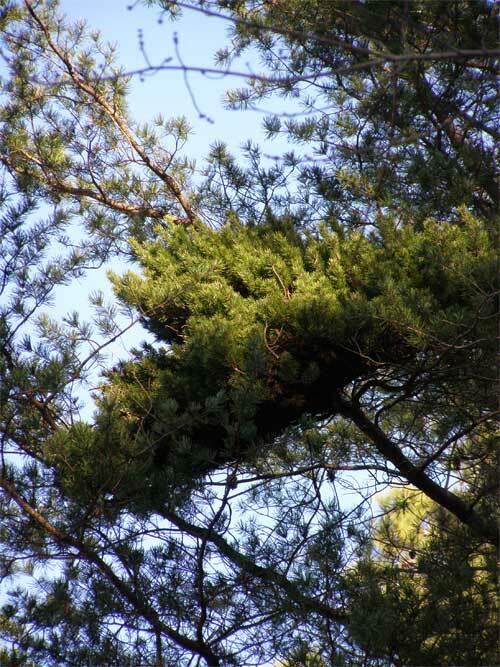 One such oddity is a dwarf loblolly pine growing along the north walk in the Coker Arboretum. That one is a dwarf seedling from a magnificent witch’s broom high up in one of the arboretum’s big pines. Sadly, that tree was killed by lightning two years ago. On your next walk through the arboretum, look for curator Margo McIntyre or one of her assistants to help you find that dwarf loblolly. These rare curiosities are most frequently spotted in pine trees, though I did find one in a red cedar, Juniperus virginiana, several years ago. More commonly spotted are the witch’s brooms in hop hornbeams, Ostrya virginiana, easily observed in winter months, when the messy looking, dense, leafless twig structures can be quite numerous on a tree, giving it a truly “bad-hair day” look. There are lots of them along the trail encircling Big Oak Woods at Mason Farm Biological Reserve. A witch’s broom looks like a bad-hair day in hop hornbeam. Photo by Ken Moore. Folklore is filled with stories of witches and their flying about on coarse twiggy brooms. I like the story of witches flying over trees to make brooms grow in them. I enjoy thinking about that story when walking beneath all those witch’s brooms in the Mason Farm hop hornbeams. It’s fun to look up into trees; never know what you may find there!